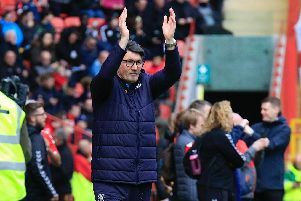 Hatters boss Mick Harford is happy to have such a selection headache ahead of him for the final 14 games of the season. The Luton chief strengthened his squad impressively during the recent transfer window, bringing in five players, and saw two of them, George Moncur and Jason Cummings play a major role in seeing off Wycombe 3-0 on Saturday. The pair might have only played 30 minutes between then, but in that time, Cummings set up his fellow sub twice to put the result beyond doubt, further improving Town’s position at the top of the table. Harford said: “We call them game changers and they precisely did that. "Jason went on a great run, I thought he’d scored, the keeper parried it down, George who's your number 10, is in the right position for a tap in. "It was a great finish for the second goal from the edge of the box and just capped what I thought was a real tough game. "The second goal was even more important I thought as they were starting to create a few chances and putting us under a little bit of pressure. "George came on and the two subs made a massive impact. "He (Cummings) got hold of the ball, travelled well with it, ran the right hand channel when (Jason) McCarthy left a lot of space when he got forward, so we put him on for that reason. “Everyone who’s come in at the moment has made a big contribution in terms of the signings and we’re absolutely thrilled with that. “I’m glad they’ve made an impact. "All of them are pushing for a start and that makes my job a little bit harder. With Kazenga LuaLua missing out due to injury, Danny Hylton returned alongside James Collins to further emphasise the quality Harford has at his disposal. He added: "Kaz had a little bit of a hamstring after the Shrewsbury game. "He’d put in great shifts in the previous games and he hadn’t really done that all season, so fair play to him, he made a massive effort and it just caught up with him a little bit. "Kaz wasn’t really ready, but we have got a strong squad, if someone goes out, we’ve got someone to replace him and that’s the beauty of getting a squad. "Hopefully that will benefit us in the run in for the upcoming games towards the end of the season. “Danny played well considering he hasn’t played for a long time.